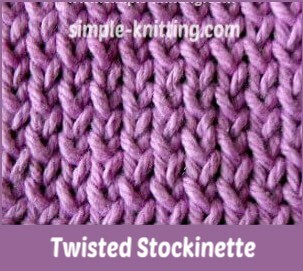 The twisted stockinette stitch pattern is a great way to change things up a little bit with you're knitting. 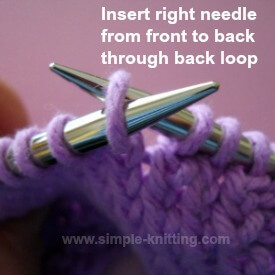 With this stitch pattern it's OK to make twisted stitches and enjoy the lovely results. Whoa! Isn't a Twisted Stitch a Knitting Mistake? Well yes and no. There's a twisted stitch knitting mistake which I talk about here and then there are beautiful twisted stitch knitting stitch patterns which is what these are. Today I decided to show you a couple of pattern stitch variations on the classic Stockinette Stitch. 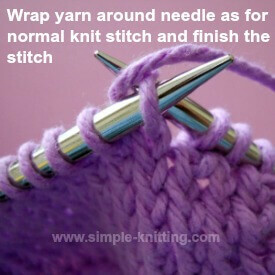 All you do is create twisted stitches to make a pretty design and a nice textured pattern in your knitting. Note: If you need help learning how to knit and purl through the back loops the tutorials on both are just below the stitch patterns. They're pretty aren't they? And the double twisted stocking stitch pattern almost looks like 1 X 1 ribbing. You can also see how it leans a bit to the left? It is easily fixed though by blocking it when you're finished knitting. This stitch pattern is made by knitting and purling through the back loops of every stitch. It's really a cool texture. Stitches are a bit tighter so gauge will be smaller. Make sure to knit a gauge swatch. The twisted stocking stitch pattern on the left has little squiggles all through it where the twisted stitches are made. 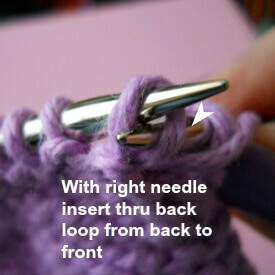 It's a little different because you twist stitches on the knit row only by knitting through the back loops. It's fun knitting this stitch pattern and it looks so pretty as an allover stitch pattern. 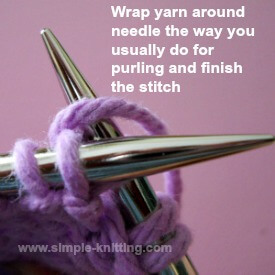 You can use both these stitch patterns for practically everything. If you'd like to switch out plain stockinette stitch for one of these you can. It's just a matter of twisting the stitches instead of knitting plain. Repeat row 1 and 2 for pattern. This stitch pattern is a little more challenging to knit so just take your time. You'll get it. 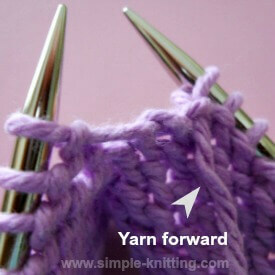 Twisted stitches are created by knitting or purling through the back loops of your stitches. For some patterns you just need to twist a stitch here and there. Other times it can be a whole row of stitches like the stockinette stitch patterns above. It just depends on the patterns. Here's a mini knitting tutorial on both techniques. 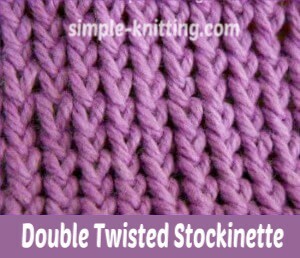 It's best to learn them now and then you can have fun creating both twisted stockinette stitch patterns. Just in case you want to see it in action, here is a quick little knitting video showing you how.